As we have learned, to have success in this league you have to build through the draft. That makes the NFL Draft so incredibly important if you want to win the Super Bowl. So how did every team grade out in the 2012 NFL Draft? Here are my team-by-team grades. The biggest needs the Cardinals had coming into New York on Thursday was to find some sort of a weapon at wideout, get some help at offensive line and to find another pass rusher for their 3-4 defense. Save for finding a pass rusher, they accomplished their objectives. Michael Floyd has many comparisons to Larry Fitzgerald's former partner in crime, Anquan Boldin, and finally gives the Cardinals somebody besides Fitz that will demand attention in terms of coverages. The Cardinals used their mid-round picks effectively to get some offensive line help, most notably the steals of Bobby Massie in round four and Nate Potter in round seven and both have the talent to start. Thanks to the Julio Jones trade of a year ago, the Falcons were without a first round selection which really would have helped this team get to potential Super Bowl contention as they are not there yet. Peter Konz was an absolute steal at 55 and if they had their first round selection, he could have been the selection at 22 and been a good pick as well because they need some help in the interior offensive line as well as a future replacement for Todd McClure. The rest of their picks did not blow me away but I really liked the selection of Jonathan Massaquoi at pick 164 as he is will be a solid addition to a pass rush that needs juice. Ozzie Newsome is one of those personnel guys that always know what they are doing come draft day and they always seem to get good value picks. Courtney Upshaw was tremendous value at 35 and he should help replace Jarret Johnson at outside linebacker and contribute to the pass rush. The Ravens filled much of their other needs throughout the rest of the draft, like getting a guard to replace Ben Grubbs (Kelechi Osemele at 60), a solid backup for Ray Rice (Bernard Pierce at 84), and a solid array of solid value picks throughout the third day, although none of those picks really jumped out at me, honestly (it is the third round though). Buddy Nix had himself a very good draft sparkled by several great value picks. They used their first round selection on Stephon Gilmore, who fills a need but I'm not a huge fan of because he was inconsistent at South Carolina. Cordy Glenn was awesome value at 41 as he should have gone in the first round; Glenn will contribute immediately at guard or potentially tackle. Nigel Bradham (pick 105) is a solid outside linebacker, Ron Brooks (pick 124) was an incredible value as despite not playing much at LSU has the skills to be a really good cornerback, Zebrie Sanders (pick 144) could end up being Buffalo's answer at left tackle and Tank Carder (pick 147) should be another rock solid linebacker as well. The Panthers' biggest need was at defensive tackle coming into the draft, despite the fact they drafted a pair of tackles in the third round last year in Sione Fua and Terrell McClain and neither of which was any good last year, but they did not draft any in the draft. Puzzling, but they still really upgraded their defense. I've loved Luke Kuechly throughout this draft process and I think he can be a star linebacker. Amini Solatolu should help upgrade their offensive line and he was good value at pick 40. Frank Alexander (pick 103) adds to Carolina's defensive end collection, Joe Adams (pick 104) gives Cam Newton an electric deep threat and Josh Norman (pick 143 and a Coastal Carolina shoutout) should contribute right away at corner. Still, no tackles? I thought the Bears had a decent draft but one that could, and should, have been better. I mean, their defensive line is still really terrible and while I understand Lovie Smith having some misguided faith in his guys but they still drafted no linemen at all. The Bears wanted another pass rusher opposite Julius Peppers but while Shea McClellin brings plus pass rush ability as I really liked him at Boise State, but he is not a great fit in a 4-3 and may have to play linebacker. Alshon Jeffery, although he is a little similar to Brandon Marshall, was a good value and has star talent if he does not eat himself out of the league (a real concern). I have some qualms with this draft but overall for the second straight year, the Bengals had a very strong draft. Dre Kirkpatrick fills a huge need at cornerback and is a great fit for their defense. They could have had David DeCastro though and while Kevin Zeitler was a solid pick at 27 and fills a big need at guard, Cordy Glenn was a much better prospect in my eyes. Devon Still (pick 53), Mohamed Sanu (pick 83), Brandon Thompson (pick 93), and Orson Charles (pick 116) were all awesome values but while I do like Dan Herron, I don't get why Cincinnati waited until pick 191 to take a running back. This draft will keep Cincinnati a playoff contender. The Browns took a stud running back in Trent Richardson, who was the best running back to hit the NFL since Adrian Peterson and has the abilities to be a star back in the NFL. I'm one of the few that actually liked the Brandon Weeden selection at 22; Cleveland has needed a franchise quarterback in like forever, if Weeden was not 28 he would be a top ten pick and if he only gives you like six or seven good years, that is still a lot better than what they have had in a really long time and better than what Colt McCoy will give you. Besides that, their draft was subpar; where were the wide receivers? Who will Weeden throw to? Save for some great picks late in day 3 in Emmanuel Acho (pick 204), Billy Winn (pick 205) and Trevin Wade (pick 245), their draft left me disappointed. Still like those first two picks. It started so good for the Cowboys; Dallas made a brilliant trade up to get a legitimate stud in cornerback Morris Claiborne at six, who will make for one badass combination at corner with Brandon Carr. However the rest of the draft was not nearly as good. Where were the guards? Where was the help at safety, which of the exception of reaching for Matt Johnson at 135? I did like the picks of Tyrone Crawford at 81, which gives Dallas another option at the five-technique, Danny Coale at 152, who helps replacement Laurent Robinson at wideout plus can punt; and James Hanna at 186, who replaces Martellus Bennett. But overall, who could have been a great draft was mostly a shrug. I really did not like what the Broncos did at the draft, considering they are looking to win right now and bringing in Peyton Manning. Derek Wolfe (pick 36) was a reach considering Devon Still, Kendall Reyes and Jerel Worthy were all on the board. What's the point of taking a quarterback in Brock Osweiler in the second freaking round? I do like running back Ronnie Hillman (pick 67) but I did not see a lot of needs addressed the rest of the way, save for the smart selection of center Phillip Blake at 108. The Lions have their strategy of taking the best player on their board and they stick to it and it has resulted in a club that was so bad at drafting under Matt Millen is now a really swell drafting club. Save for the Ryan Broyles pick in the second round that didn't fill a need nor was the best wideout on the board, the Lions may a bunch of really good selections. Riley Reiff had a bit of a Bryan Bulaga fall in the draft and he gives the Lions a tackle prospect that they have been needing badly for a long time. The rest of the draft saw Detroit get really good value that filled needs in cornerback Dwight Bentley (pick 85) and both Lewis Oklahoma linebackers in Ronnell (125) and Lewis (223). And even the Broyles pick gives Matt Stafford another solid deep threat weapon once he is fully healthy. I saw this every year that it's pretty much a cliche that Ted Thompson is a great drafter. The Packers had needs on the defensive side of the football in getting an edge rusher, another lineman and another cornerback and they achieved all three in their first three picks in all good values. I would have taken Courtney Upshaw over Nick Perry but Perry finally gives the Packers a pass rushing threat opposite Clay Matthews. Jerel Worthy was a great value at 51 and gives Green Bay a pass rusher on their 3-4 front. Casey Hayward (pick 62) is a solid corner. Thompson then found some good value in the final round in offensive tackle Andrew Datko and a nice flier in quarterback B.J. Coleman. The Texans took a really good defense and made it better in this draft. They wanted another pass rusher to team up with Brooks Reed and Connor Barwin off the edge and they got a great value in a true physical freak in Whitney Mercilus at the end of the first round. Jared Crick all the way down at pick 126 adds some needed depth along their 3-4 front. Houston also helped out their interior offensive line by taking Brandon Brooks and Ben Jones in the third round. But where was the receiver to team with Andre Johnson? That's still a major hole right now and reaching for DeVier Posey is not the answer by any stretch. But overall, a very solid draft. Obviously this draft was all about Andrew Luck, as it should have been if he is going to be the franchise quarterback that he can absolutely be. Indianapolis made three really good picks in tight ends Coby Fleener (34) and Dwayne Allen (64) and electric wideout T.Y. Hilton (92). Vick Ballard (170) should also contribute right away at running back. The Colts really needed to get some reinforcements for their offensive line but only picked tackle Justin Anderson from Georgia at 208. Plus the Colts also had major needs on their defense, which is converting to a 3-4, but they did make a wise choice in nose tackle Josh Chapman at 136. The Jaguars started their draft off really well and then it was all downhill from there. The Jaguars desperately needed to find a wideout for Blaine Gabbert so they made the brilliant move to move up to the fifth overall pick at not much cost at all to take the best receiver in the draft in Justin Blackmon, who immediately becomes the top wideout on Jacksonville's roster. Jacksonville followed that up with another great pick, and some much needed juice for their pass rush, in taking Andre Branch at the 38th pick. But after that, it was not good. I understand the Jaguars taking a punter like Bryan Anger but in the freaking third round? That was ridiculous. And the rest of their selections were pretty bleh as well. Chiefs personnel guy Scott Pioli comes from the Belichick system of building through the draft but he really did not have a great go at it. Dontari Poe fills a big need at nose tackle but his play at Memphis really disappointed for somebody who blew up the Combine nor was he the best defensive tackle at the board at 11 either. The Chiefs made a pair of decent line picks in Jeff Allen in the second and Donald Stephenson in the third but if they were going to hit the line in the draft, then why not go David DeCastro at 11? I thought that Cyrus Gray selection at 182 was their best pick in the draft as Peyton Hillis is a wild card and he is a nice complement to Jamaal Charles. Say what you want about Ryan Tannehill, the Dolphins had to take him. The Dolphins have needed a franchise answer at quarterback and having been over a decade since Dan Marino retired, the fact they still did not get one in really bad. Yes Tannehill was a reach and is very raw but this is the best scenario for him as he does not have to play right away plus his college coach is his offensive coordinator. If Miami passed on him, nobody would go to their games. Even though the Dolphins took way too long to select a receiver, even though I like the B.J. Cunningham selection at 183 and Michael Egnew should contribute right away at receiver, their draft was pretty solid. Jonathan Martin was ridiculous value at 42 and he immediately upgrades at right tackle. Olivier Vernon gives the Dolphins someone else that can rush the passer and Lamar Miller was a great value pick at 97, even as Miami didn't need a back. I was all ready to rip Rick Spielman if he selected Morris Claiborne over Matt Kalil but not only did he make the correct decision in taking Kalil, he picked up a couple of picks from Cleveland when the two swapped first round selections. 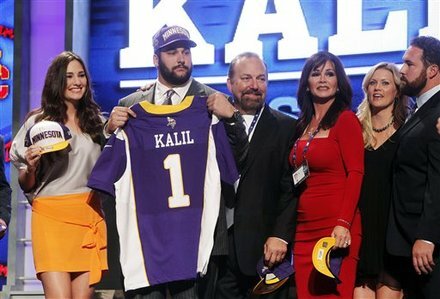 Kalil was regarded as the best offensive tackle to hit the league since Joe Thomas and he'll provide the protection that Christian Ponder desperately needs (and the hot family we all were looking for). The Vikings filled a lot of needs in what was a really good draft overall. They made a wise move to trade back into the first round to get the free safety they needed in Harrison Smith, they got a talented cornerback in the third round in Josh Robinson and got some weapons for Ponder in Arkansas wideouts Jarius Wright and Greg Childs. This was a draft that after the first day I was ready to give them an A grade because they had a great first round in trading up for both Chandler Jones and Dont'a Hightower as both should immediately provide some juice to the Patriots' linebacking unit. I also leave the great steal of Alfonzo Dennard in the seventh round. But the rest of Bill Belichick's selections were reaches. They took Illinois safety Tavon Wilson, who had a high ranking on a draft board at 183, with the 48th pick. If you are going to reach for a guy like Wilson, don't do it in the second round. The other three selections were also reaches as well. Thanks to the Mark Ingram trade-up a year ago, as well as the penalties because of Bountygate the Saints did not until the third round so they had to make their picks count. They hit and they missed. Canadian defensive tackle Akiem Nicks was a reach at 89 but he has a lot of upside so it's not a bad gamble. Wisconsin wideout Nick Toon (122) was a good value and he should help to replace Robert Meachem as part of the Saints' consortium at receiver. Samford safety Corey White was an awful selection at 162 as he seemed to be going undrafted. The Saints in their last two picks got some needed depth for their offensive line. The Giants look to take the best player available all the time which makes them a good drafting team. They looked all set to take Boise running back Doug Martin before Tampa jumped ahead of them to take him so they filled their hole at running back by selecting David Wilson, the next best back on the board. Reuben Randle was Randall Cobb 2.0 at the draft (SEC wideout, last guy in the green room, last pick of second round to defending Super Bowl champion) and he should immediately fill the void of Mario Manningham. Jayron Hosley (pick 94) has some character concerns but he has starting cornerback talent and he should fill the void of Aaron Ross. Adrien Robinson was a solid game at the end of round four and he helps to fill the gap at tight end. The Jets took some risks in the draft and while they could all work out, some of them can absolutely burn. I would have gone with Melvin Ingram with their first pick but if Quinton Coples works his tail off, which was a serious question his final year at North Carolina, he will be the rare double-digit 3-4 end and desperately help their pass rush. Stephen Hill comes into the NFL even more raw than Demaryious Thomas but he was awesome value with the 43rd pick and should contribute to their receiving unit immediately, catching passes from Mark Sanchez or that other guy. Demario Davis, pick 77, was a reach but he could be the replacement for Bart Scott. The Jets also got a steal in safety Antonio Allen, who despite going late in round seven should contribute immediately. Thanks to the Carson Palmer trade as well as their selection of Terrelle Pryor in the supplemental draft, the Raiders did not pick until the end of the third round and the end of day two so they had to find studs in essentially all of day three. From what limited picks they did have, new Raiders general manager Reggie McKenzie made some nice picks. Tony Bergstrom (pick 95) can play multiple positions and can help immediately for Oakland's porous offensive line. Miles Burris (pick 129) can help replace the departed Kamerion Wimbley, as will Jack Crawford (pick 158). Although he did not fill a need, I loved the selection of wideout Juron Criner as he was tremendous value with the 168th pick. Andy Reid accomplished everything that he likes to do in an NFL draft, work on the defensive line, often take the top prospect on the board and get another developmental quarterback. Missison accomplished and I loved almost everything that Reid did in this draft. The Eagles wanted another tackle and they got the best one in the draft in Fletcher Cox, who has ten sack potential from the interior of the line. Mychal Kendricks is a really talented linebacker and defensive end Vinny Curry was a steal at the 59th pick. I'm not a big fan of Nick Foles but like I said, Philadelphia loves to take developmental quarterbacks. Brandon Boykin (pick 123) should help replace Asante Samuel right away, Marvin McNutt (pick 194) gives the Eagles the big wideout they've craved, Brandon Washington (pick 200) adds some depth to the offensive line and Bryce Brown (pick 229) has some talent at back. The Steelers draft was just pure gold as they really took advantage of teams that don't know what they are doing. It's a felony that David DeCastro fell to the freaking 24th pick as he is the next Steve Hutchinson and he is a big upgrade to the Steelers' line. Mike Adams falling to 56 is a byproduct of having some work ethic issues as well as some character problems but he's too talented for Pittsburgh to pass up there. Sean Spencer at pick 86 is a little questionable as he is the right fit for a 4-3 defense at outside linebacker and I don't see the fit in a 3-4. Nose tackle Alameda Ta'amu was another piece of grand larceny with the 109th pick and Chris Rainey adds some gamebreaking speed to the backfield. The Chargers had a really good draft and made a bunch of solid value picks but I can't give this draft an A because they seemingly ignored the offensive line, which was not very good a year ago. How in the world Melvin Ingram, the seemingly consensus top pass rusher in the draft, fell to 18 while jokers like Bruce Irvin go ahead of them is completely and utterly insane. Ingram fills a big need as the Chargers' pass rush a year ago sucked. Kendall Reyes was a good value at pick 49 and he adds some run stuffing ability to the Chargers' front. Brandon Taylor (pick 73) should start right away at strong safety and Ladarius Green (pick 110) is a tight end I really liked at Louisiana-Lafayette. Save for a few good value selections, I really was not a fan of the 49ers' draft this go around. A.J. Jenkins is a good player and fills a need for a vertical threat (unless Randy Moss finds the Fountain of Youth or pulls some Cocoon action, speaking of which I need to watch that film again because it's so good) but he was a clear reach at 30 with Stephen Hill, among others, still on the board. I'm not a fan of LaMichael James and the 49ers have like fifteen running backs on their roster already. Joe Looney (pick 117) will contribute right away at guard and they found really good value in safety Trenton Robinson (pick 180) and pass rusher Cam Johnson (pick 237) late. Where to start. Bruce Irvin, my goodness, was one of the worst first round picks in a long time. Irvin was not a first round prospect on anybody's board as he has yet to develop into a football player and the only thing he can do is rush the passer, nothing else. Where are you going to play him in a 4-3 because he is too light to hold at defensive end. And you had Melvin Ingram, Chandler Jones, Quinton Coples, Whitney Mercilus all on the board there. Plus Irvin has major character problems as well, getting arrested for robbery and defacing public property. Bobby Wagner was not a great pick at 47 as he was a slight reach and if the Seahawks had not traded down they could have taken a much better player in Mychal Kendricks. The picks of Russell Wilson, who can play quarterback in this league despite being almost my height, and Robert Turbin, a solid back, save this draft from being a fail. The Rams really wanted to get Justin Blackmon but lost out when the Jaguars moved in front of them. After they moved down to the 14th pick, they lost out on Michael Floyd so they did the next best thing and took a top defensive tackle in Michael Brockers, who should make their defensive ends, Chris Long and Robert Quinn, even better. With their second rounds picks they made one great pick in cornerback Janoris Jenkins, who does come with a lot of risk, and two decent picks in wideout Brian Quick and running back Isaiah Reed. Trumaine Johnson was a steal at 65 and he'll help upgrade the Rams' secondary and Chris Givens was a solid value at 96 and he'll give Sam Bradford a weapon to play with. I really was a fan of what the Buccaneers did in the draft. I probably would have stayed at five and select Morris Claiborne but Mark Barron makes a lot of sense as he provides a talented enforcer in the secondary in the mold of Adrian Wilson that can help cover guys like Saints tight end Jim Graham. Some joker told me that Tampa didn't need to move up for Doug Martin at 31, even though the Giants were probably going to take him at 32 but took David Wilson after Martin was off the board. Martin gives the Bucs' running game some spice as many think he could be a similar player to Ray Rice or Matt Forte. Lavonte David was a wise pick at 58 as he gives Tampa much needed help at linebacker. Didn't love the Buccaneers waiting to pick 174 to take a cornerback but Keith Tandy was a good value there. I am surprised the Titans chose not go to with either David DeCastro in the first round or Peter Konz in the second as either would have greatly helped their offensive line, which struggled to block for Chris Johnson a year ago. That said, I liked what the Titans did. The Titans needed a vertical threat to pair with Kenny Britt for young quarterback Jake Locker and I was a big fan already of Kendall Wright (Disclaimer: this pick also won me a free meal thanks to a bet made with someone who overreacted to Wright's poor 40 at the Combine). Zach Brown is an athletic freak for a linebacker but his work ethic is poor and he needs to play more physical in order to succeed in the league. Mike Martin (pick 82) was a good value and should help out the Titans' defensive line. The Redskins paid a steep price to trade up for Robert Griffin but it was absolutely the right move. The Redskins should have approached the draft they way the Colts did in getting weapons and protection for Andrew Luck (although the protection aspect was lacking for Indianapolis). While the Redskins did make some solid line picks (although Josh LeRibeus was a reach at 71), taking Kirk Cousins at 102 was really, really dumb. The Redskins had a lot of needs to address, taking another quarterback when you already have selected your franchise quarterback in the hopes of getting something for him in the future is stupid, quite frankly. Good call, accidentally put the two names together and was not referring to the CBS News correspondent. Fixed.